When I began carving stone I read every book I could find on stone sculptors and stone sculpture. Henry Moore is one of the giants in 20th century sculpture, began his artistic career as a stone sculptor, and was a brilliant and prolific writer. I devoured all his essays. I found treasures of insight into the medium of stone and how Moore thought about stone and sculpture in general. He wrote a lot throughout his career and you can read the evolution of his creative thinking in his essays and letters. His writing was a great help to me in developing and expressing my own vision. He had five basic tenets. I do not subscribe to several of them, but the knowledge of their existence was fundamental in choosing my own path into stone sculpture and figuring out how to think about stone. Direct Carving—working directly on the material (stone or wood) without modeling in clay or plaster. He later worked in plaster and cast to bronze. Truth to materials—What you sculpt out of a certain material should have the feel of that material. Stone-sculpted forms should have a weight and mass that is intrinsic to the raw stone. He later incorporated a tremendous amount of movement in his stone sculptures. 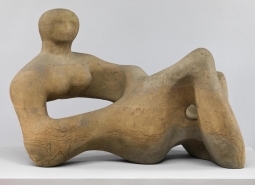 Constructivism and Surrealism—these philosophies replaced the constricting ideas of the classic European art world for Henry Moore. He was a rebellious artist and needed to break away from antique traditions of how to think about art. Three Dimensionality—the importance of negative space (holes) in accentuating the positive space (the sculpture.) Barbara Hepworth was the first stone sculptor to use holes as elements of design in her abstract stone sculptures. Moore totally embraced this idea and used it for the rest of his career. Inspiration from Nature—Pebbles and bones were fascinating natural sculptures that inspired his abstract vision. The idea that they were found and not made was extremely significant.